Are you having eye symptoms that you think may be due to allergies? What symptoms do people have with allergic conjunctivitis and what symptoms may mean something else is going on? How are eye allergies diagnosed, and how are they treated? Symptoms of eye allergies, or allergic conjunctivitis, include watery, itchy, red, sore, swollen and stinging of the eyes. Itching of the eyes is the most common symptom of allergic conjunctivitis. Without itching, it is much less likely that a person is suffering from allergies of the eyes. Both eyes are usually affected, although one eye may be more symptomatic than the other. Eye allergies are very common and thought to affect between 6 and 30 percent of the general population at some time and up to 30 percent of children, developing most commonly in late childhood and early adulthood. They can result in poor performance at work or school and less enjoyment of leisure time activities. Seasonal allergic conjunctivitis (SAC) is the most common form of eye allergy, with grass and ragweed pollens being the most common seasonal triggers. It often accompanies other symptoms of seasonal allergies such as a runny, itchy nose, and nasal drainage. Perennial allergic conjunctivitis (PAC) is also very common, with animal dander, feathers, and dust mites being the most important triggers. In addition to itching and watery eyes, you may notice other symptoms with eye allergies. Some people notice sensitivity to light or blurred vision. Your eyes may be red (similar to pink eye) and your eyelids may become swollen. When the inside of the eyelid (the conjunctiva) is also swollen, your eyes may have a watery, gelatinous-like appearance—a condition referred to as "chemosis". Vernal keratoconjunctivitis is a severe form of eye allergy most common in late childhood in which the upper conjunctiva take on a "cobblestone" appearance due to enlarged lymphoid follicles. The diagnosis of allergic conjunctivitis is made with a history of symptoms suggestive of eye allergies, an examination by a healthcare professional with findings consistent with conjunctivitis, and, often times, allergy testing showing seasonal or perennial allergies. A response to typical medications is helpful in the ultimate diagnosis of allergic eye disease, and failure to respond to medications may lead to a search for a different diagnosis. There are a number of conditions that can cause red eyes, and some of these are emergencies. Conditions such as viral or bacterial pink eye are usually easily treated, whereas conditions such as glaucoma can result in vision loss without early diagnosis. Warning signs that suggest that something other than eye allergies include severe eye pain, significant light sensitivity (photophobia,) decreased vision, colored halos, and a history of trauma to the eyes. The "best" treatment overall for eye allergies is to avoid the allergic triggers - the allergens that lead to your symptoms. This, of course, is not always possible, and may actually be detrimental. For example, avoiding outdoor activities to reduce your eye allergy symptoms may lead to a lack of exercise and "cabin fever." The balance between exposure to allergens and tolerating symptoms will be different for each person. There are a number of simple measures for reducing dust mites and controlling other indoor allergens. With seasonal allergies, people may wish to limit their time outside when pollen counts are high or use an air purifier in their home. Conservative or "natural treatments" can be helpful at times. These may include using cold compresses on your eyes and eyewashes with tear substitutes. While these can be of some benefit, many people need medications as well. 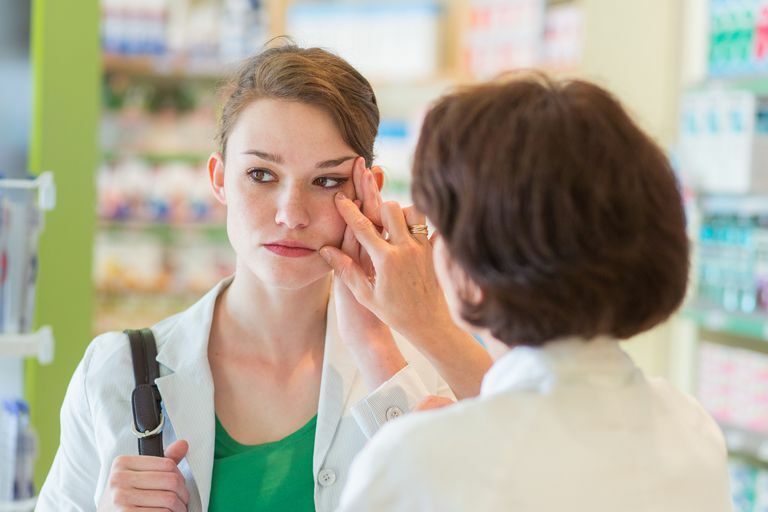 There are a number of different options for treating eye allergies, both over-the-counter, and prescription, and both oral preparations and those applied directly to your eyes. Oral anti-histamines. Many people with allergic eye disease will receive benefit from oral antihistamines, such as prescription or over-the-counter Claritin (loratadine,) Zyrtec (cetirizine,) Allegra (fexofenadine,) Clarinex (desloratidine,) and Xyzal (levocetirizine.) Older, first-generation antihistamines (such as Benadryl (diphenydramine) or hydroxyzine are also helpful, but are generally considered too sedating for routine use. Zyrtec and Xyzal may be slightly more efficacious for allergy symptoms but also have a slightly increased rate of sedation. Over-the-counter eye drops. Medicated eye drops are available in over-the-counter and prescription forms. Over-the-counter eye drops for allergic conjunctivitis are currently only available in decongestant preparations such as Visine (naphazoline), and decongestant/anti-histamine combinations such as Visine-A (naphazoline/pheniramine). Decongestant eye drops (with or without anti-histamines) should only be used for short periods of time, as overuse can lead to conjunctivitis medicamentosa (characterized as rebound eye redness/congestion and dependence on the eye drops). These eye drops should not be used by people with glaucoma, and used with caution by people with heart or blood pressure problems. Prescription eye drops. Eye drops which may be helpful include topical antihistamines, topical mast cell stabilizers, and topical non-steroidal anti-inflammatory medications. When very severe, topical steroid drops may be prescribed as well. When symptoms are very severe, topical steroids may be needed, but should only be used for severe symptoms and under the close guidance of a physician. It's important to recognize both the brand name and generic names of medications you choose to use, as well as the dosage. Many allergy medications are available both over-the-counter and by prescription (frequently with different dosages) as well as in brand name and generic preparations. All too often people end up using two preparations of the same medication thinking that they are separate drugs. This not only results in less effectiveness but can result in an excess dose of a medication. Depending on the severity of your eye symptoms, as well as the presence of other allergic symptoms such as allergic rhinitis, or asthma, many people choose to undergo allergy testing and allergy shots. Allergy shots are the one way that your allergies may actually be "cured" and are thought to sometimes reduce your risk of developing other allergies as well. Eye allergies may seem like a minor complaint relative to some other medical conditions, but can seriously affect your quality of life. Whether your allergies occur only seasonally or are instead present year-round, avoidance is not always possible, nor always a healthy option. Working with your allergist can help you find the treatment which best controls your symptoms and restores your quality of life. For some people, especially those who are also coping with allergic rhinitis or asthma, allergy shots may eventually eliminate your eye symptoms so that medications are no longer needed. Berger, W., Granet, D., and A. Kabat. Diagnosis and Management of Allergic Conjunctivitis in Pediatric Patients. Allergy and Asthma Proceedings. 2017. 38(1):16-27. Leonardi, A., Castegnaro, A., Valerio, A., and D. Lazzarini. Epidemiology of Allergic Conjunctivitis: Clinical Appearance and Treatment Patterns in a Population-Based Study. Current Opinion in Allergy and Clinical Immunology. 2015. 15(5):482-8. Tarff, A., and A. Behrens. Ocular Emergencies: Red Eye. The Medical Clinics of North America. 2017. 101(3):615-639.